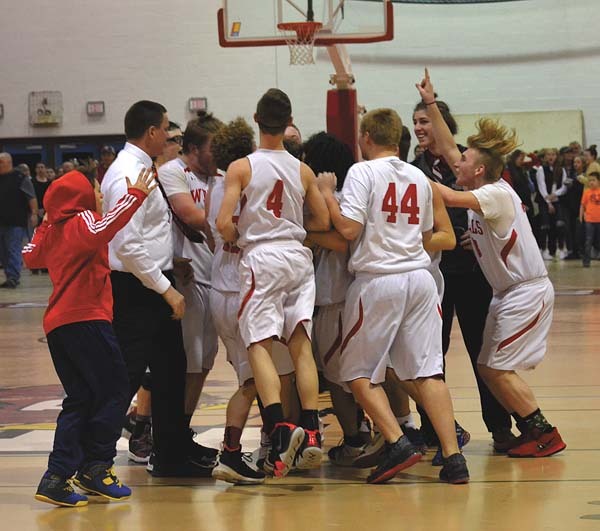 PLATTSBURGH — After trailing for much of the game, the Wells boys basketball team found itself in a fourth-quarter slugfest with Willsboro in the Section VII Class D championship game at the Plattsburgh State Field House on Saturday. The top-seeded Indians and second-seeded Warriors traded big shot after big shot in a final frame that featured 11 lead changes or ties. Wells landed the final blow when sophomore Byron Stuart dribbled to the basket along the left baseline and hit a floater to give the Indians a 48-47 lead with just six seconds remaining. 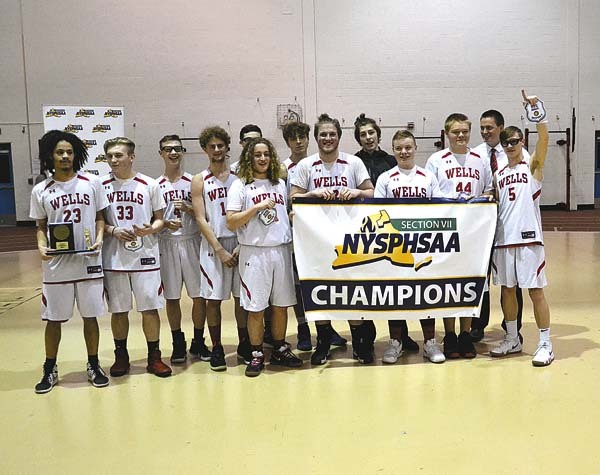 Willsboro was unable to get off a final shot and Wells claimed its first Section VII Class D title since 2002. 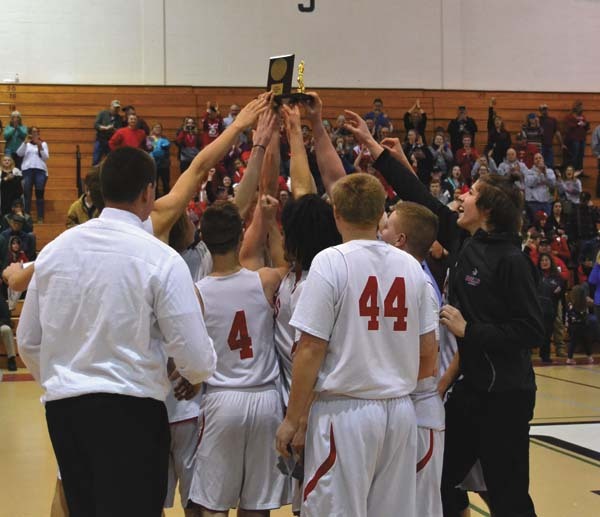 The shot capped a remarkable comeback for the Indians, who trailed by as many as 11 points in the second half. 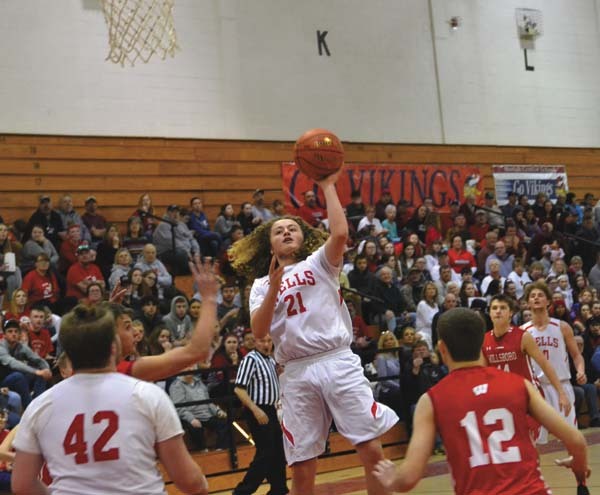 Coby Stuart, who had 25 points in the Indians’ semifinal win over Schroon Lake on Wednesday, was hampered by foul trouble and scored just two points Saturday. Picking up the slack for the Indians was senior Tre Zimmerman, who finished with a game-high 25 points. Senior Shane Kennedy also hit double figures for Wells, finishing with 11 points. Byron Stuart added nine points for the Indians, scoring six of those points in the fourth quarter. 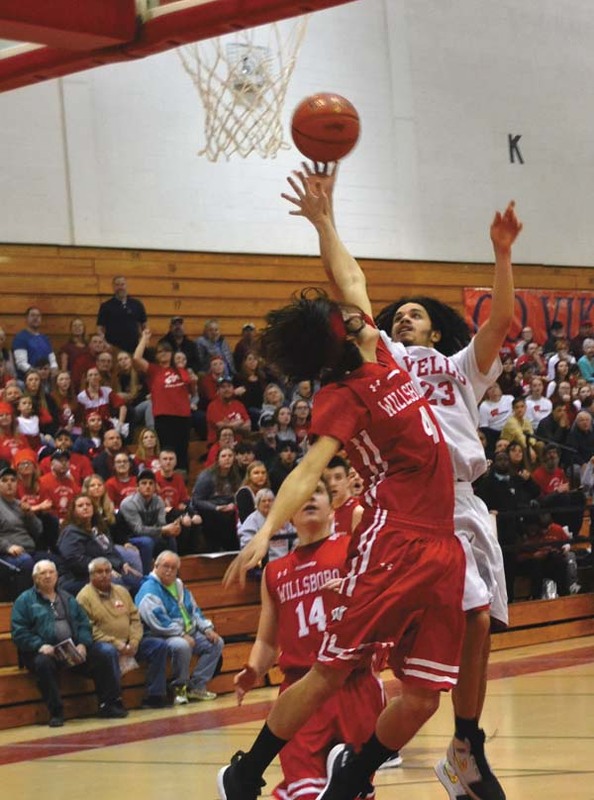 Trevor Bigelow scored 20 points to lead Willsboro, while Jared Joslyn finished with 12 points. Wells started off quickly Saturday, getting a pair of baskets from Kennedy down low to open a 4-1 lead in the first 37 seconds of the game. Willsboro answered with a 7-2 burst that included a 3-pointer from Bigelow to take an 8-6 lead. 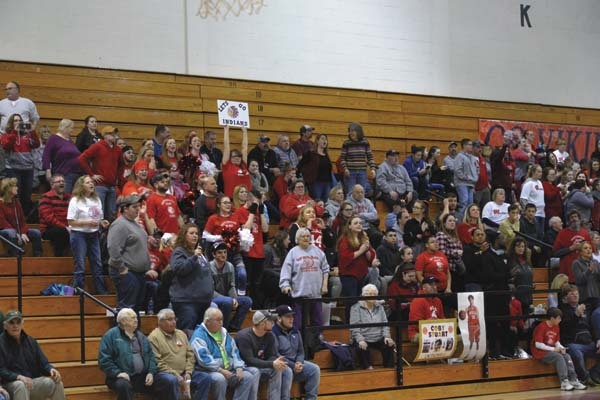 The Indians bounced back to take a 10-8 lead with 3:41 left in the first quarter before Willsboro used a 8-3 run to finish the opening frame with a 16-13 lead. Bigelow scored eight points in the first quarter for the Warriors, while Kennedy had seven first-quarter points for Wells. The Warriors maintained the lead throughout most of the second quarter, outscoring Wells 12-10 to lead 28-23 at the half. Zimmerman, who had 12 first-half points, scored seven in the second quarter for Wells, while Bigelow had six in the second quarter to finish the first half with 14 points. Late in the first half, the Indians switched from man-to-man defense to a 2-3 zone. 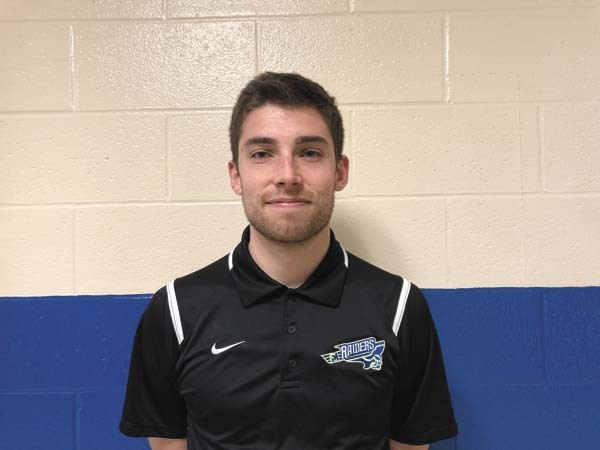 The move paid dividends as Wells held the Willsboro to just eight points in the third quarter. Down 36-31 after three quarters, the Indians mounted a charge in the final frame. Willsboro picked up its seventh team could with 7:25 left in the game, putting Wells in the bonus. The Indians connected on 3-of-5 free throws in the final quarter. Wells opened the fourth with a 7-0 run that included five straight points from Zimmerman to take a 38-36 lead, their first since the first quarter. Willsboro answered with a 3-pointer from Bigelow on their next possession to take a 39-38 lead only to have Kennedy responded with a basket to give Wells a 40-39 lead with 4:36 to play. Bigelow connected on another 3-pointer on the Warriors’ next trip down the court, making it 42-40 with 4:19 left. The see-saw battle continued as Byron Stuart scored to make it 42-42 only to have Willsboro’s Joslyn answer with a basket to make it 44-42 with 3:52 left. Byron Stuart tied the game again with 2:06 to play with his second straight basket, making it 44-44. Zimmerman gave the Indians a 46-44 lead with 1:33 to play before Coby Stuart picked up his five foul with 1:21 remaining. Wells’ Tyler Bolebruch was fouled with 41 seconds remaining, but missed the front end of a 1-and-1, leaving the score 46-44. The Warriors grabbed the rebound and called a time out with 27.6 seconds left. After the timeout, Joslyn buried a 3-pointer from the near the top of the key to make it 47-46 Willsboro with just 20 seconds to play. Following a timeout by Wells, Byron Stuart brought the ball up the court and broke for the baseline with 10 seconds to play before hitting his running floater to give the Indians a 48-47 lead with just six seconds to play. Willsboro scrambled to get the ball up the court, but the Warriors couldn’t get a final shot off as Wells claimed the victory. The Indians, who were 1-5 after six games this season, ran their win streak to 16 games with the victory. “We started out slow this season, but we picked it up and went undefeated in our league,” Byron Stuart said. Wells (17-5 overall) advances to face Section II champion Oppenheim-Ephratah in the regional finals next Saturday at Hudson Valley Community College in Troy at 2:45 p.m.
Willsboro finished its season with a 16-7 overall record. Arnold 1-1-3, Ahrent 3-1-7, Lee 1-0-2, Joslyn 4-3-12, Bigelow 5-6-20, Bell 0-1-1, Schier 1-0-2. Totals 15-12-47. 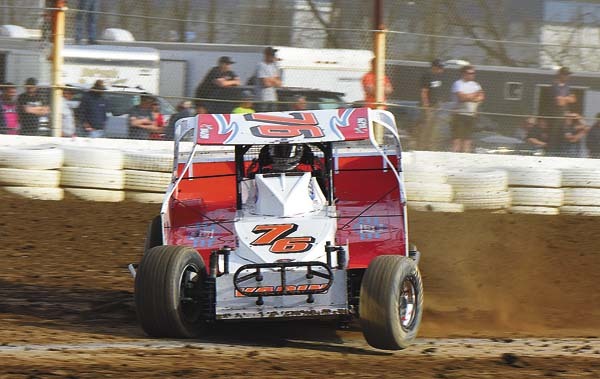 C. Stuart 0-2-2, Bolebruch 0-1-1, B. Stuart 4-1-9, Zimmerman 11-3-25, Kennedy 4-3-11. Totals 19-10-48. 3-point goals: Willsboro 5 (Bigelow 4, Joslyn); Wells — none.